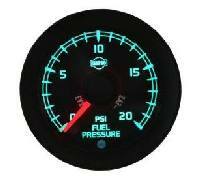 These gauges are a perfect match for 2007.5 & newer GM trucks with the LTZ premium interior package, including fonts, pointer design, backlit color, and the double-lined torpedo-shaped index marks. They are a very good match (colors, etc.) for all GM trucks with turquoise backlit factory gauges.